Many thanks to you, Kelsey Garmendia, for spending some time with all of us at BOD to spotlight you as an author and member. It’s a privilege to share with everyone a little bit about you. 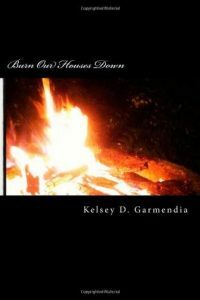 Kelsey, on Goodreads you mentioned that Burn Our Houses Down was written as part of your participation of NaNoWriMo a couple of years ago. Was this the first time you had written a full novel, or have you been writing forever? I’ve been writing for what seems like forever, but I mostly focus on microfiction or creative non-fiction. I started several novels, but Burn Our Houses Down (BOHD) was the first novel I was able to complete. Burn Our Houses Down is the first apocalypse book I have read that focuses so much on how an apocalypse can happen or be perpetuated because of our perception and understanding or lack of reality. Can you tell us a little bit about how this theme came to fruition in this book? When I write, I like to put the world we live in and the people that we know into the novel. I call myself a supernatural realism author. I believe as a society, we’re very unaware of how vast the world really is and how much we all affect one another. It seems to me that everyone lives in a comfortable bubble. When we’re inside of it, nothing can touch us. We grow our little worlds and walk among everyone else day-to-day without a second thought. In BOHD, I pop that bubble. Now, everyone and everything the characters know is shattered. I focus the storytelling on how they cope with that. You use dreams as a means to communicate or foreshadow warning events to your characters in Burn Our Houses Down. How much do you feel our dreams play a part in our everyday decision making? When I have a vivid dream, it’s all I can focus on throughout the day. I’ve had certain ones that steer me clear of doing things sometimes. I think a lot of people trust their dreams as much as they trust gut decisions. If your brain is telling you in your sleep that something is wrong or off, there’s a good chance that you’ll try and steer clear of whatever it may be. One of the things I enjoyed about your book was how unpredictable it was. So on those lines, and without spoiling the plot of Burn Our Houses Down, can you tell us what a wendigo is? There’s tons of different lore on wendigos, but I’ll keep a tad bit vague for you. They are believed to be demons that possess humans and make them crave human flesh. What can we expect from Hayley, Xavier, and Aisley in the next book, and when we will be able to read it? Painted Red, the third (and possibly final) installment is due to hit electronic shelves in early 2015! Yes, I do! I just recently released a supernatural realism novel entitled, Disenchanted. It’s about two extraordinary people being thrown into everyday life. It’s available now! I know you recently got married. Has your real life romance played a part in writing the love story of Hayley and Xavier? Has it influenced any of your other writing? It actually hasn’t surprisingly. Each love story is different. I believe knowing what love feels like helps big time. But with Hayley and Xavier, their entire backstory is different from mine and my husband’s. That’s what makes love so interesting. It’s unique for everyone. If you could be mentored by any author of your choice, who would it be and why? I would love to be mentored by Edgar Allan Poe. I know he’s long gone, but the way he compelled me to keep chugging through his stories was something that I try and recreate in all of my work. It would be amazing if I could just experience him telling and writing a story. What is an odd, quirky detail about yourself that no one knows about until they meet you in person? I sing covers of songs on YouTube. I have an affair with music that I don’t think I’ll ever break off. Thank you so much, Kelsey, for taking this time to share a little bit about yourself and your writing. As a fellow BOD member, and from all of us, we wish you the best. Thank you so much again for allowing me to be featured here! It means the world! Hayley and Xavier, two young adults from the small town of Pine Bush, N.Y. have been friends since childhood. After Hayley’s twin sister dies in a car accident, Xavier is determined to get her out of her funk. They go on a camping trip that is ended abruptly by a wildfire. When they make into the town in the valley of the Shawangunk Mountains, everyone is missing, all the food is gone and something is in the woods. Something, not quite human, is at the top of the food chain now. Kelsey D. Garmendia, 24, is an alumnus of the State University of New York at New Paltz. She obtained a Bachelors Degree in English with a concentration in Creative Writing. Garmendia is featured in Confettifall, Embodied Effigies, Penduline Press, The Stonesthrow Review, My Unfinished Novel, Poydras Review, and Midnight Screaming. She also has three self-published novels: Burn Our Houses Down and If I Lose are both part of a book series with the next installment to be published early in 2015 and her newest novel, Disenchanted, is a stand-alone. Besides writing, she has sports photography published on the student-run journalism site, The Little Rebellion.